Eliot Spitzer's first TV interview since resignation is with CNN's "Fareed Zakaria GPS"
(CNN) -- In his first television interview since being forced from office in a prostitution scandal, former New York Gov. Eliot Spitzer talked with CNN about his personal failings, the AIG bailout and President Obama's handling of the economy. Ex-New York Gov. Eliot Spitzer says focusing on those AIG bonuses misses the bigger financial picture. 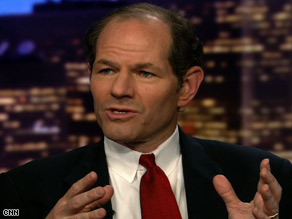 In a wide-ranging discussion, Spitzer told CNN's "Fareed Zakaria GPS" that he thinks he still has a duty to speak about issues like million-dollar bonuses to American International Group executives, but that he comments on the issues "with full awareness and heaviness of heart about what I did." "I would say to [critics] that I never held myself out as being anything other than human," he said in the interview, which airs Sunday at 1 p.m. ET. "I have flaws as we all do, arguably. I failed in a very important way in my personal life. And I have paid a price for that." The former governor, a Democrat who led New York from January 2007 until he resigned in March 2008, was hired recently by Slate magazine to write a regular online column. Spitzer, who was New York's attorney general for eight years, said he is concerned about the economic crisis and other problems the nation is confronting. "These are issues that I feel deeply about," he said. "But I am where I am because of my own conduct. And as I say, I make no excuses." His first column for Slate criticized the federal government's bailout programs. One of the companies to receive bailout money ($173 billion) was insurance giant AIG, which scheduled $165 million in bonuses to senior executives. Spitzer told CNN that executive bonuses may grab headlines, but the insurance company's payouts on complicated financial instruments deserve closer examination. Spitzer said that AIG was at the "center of the web" of transactions that have forced a massive bailout of the U.S. financial system, and that the insurer's woes stem from financial practices he first investigated as New York's attorney general. AIG's collapse stemmed largely from its array of exotic financial products such as credit-default swaps, which went sour when the U.S. housing market turned south after 2006. "Bonus is a real issue. It touches us viscerally," Spitzer said. But he added, "The real money and the real structural issue is the dynamic between AIG and the counterparties." Much of the $170 billion in taxpayer funds AIG has received is going straight to the buyers of its instruments, which amounted to a form of insurance on mortgage-backed bonds. With the housing market in free fall and foreclosure rates spiking, those bonds have tumbled dramatically. That forced AIG to pay out money it didn't have to its clients. "Virtually all" of the $80 billion-plus in the initial AIG bailout went to the company's counterparties, including nearly $13 billion to investment bank Goldman Sachs alone, Spitzer said. "Why did that happen? What questions were asked? Why did we need to pay 100 cents on the dollar on those transactions if we had to pay anything?" he asked. "What would have happened to the financial system had it not been paid? These are the questions that should be pursued," he said. Spitzer commended Obama for the way the he has handled the economic crisis, comparing the situation to putting out 500 fires. It is a difficult task to institute good policies that will bring back the economy while keeping support of the nation's citizens, Spitzer said. "I think one of the largest, most difficult tasks that he has is to control the outrage that is brewing in the public, sympathize with it and garner it, but use it to get good policy, not policy based upon anger," he said.